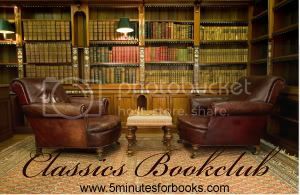 Our Classics Bookclub at 5 Minutes for Books is undergoing a few changes, based on the suggestions and indications of our readers. We're excited to change things up a bit and if you want to know more of what I'm talking about, click over to the Bookclub Post for an explanation. As the team talked about what we'd like to see happen with the Bookclub, one thing we agreed to keep up was the plan for November's bookclub - to read anything you'd like by Louisa May Alcott and share what you read with the group. I've been waiting and waiting for this month because I found two holiday classics by Alcott that I was excited to delve into! So without further ado . . .
An Old-Fashioned Thanksgiving was first published in St. Nicholas magazine in November, 1881. It reappeared in Aunt Jo's Scrap-Bag, volume VI, in 1882 and again in St. Nicholas Anthology in 1948. Hallmark has since made a movie adaption of the story. In fact, seeing that it had been made into a movie was another one of my original drives to go ahead and read the story and see what it was about. It is the story of the Bassett family who make their residence in New Hampshire in the 1820's. I have the Holiday House edition of this book, which was published in 1974 (I believe) and keeps the original spelling. Another aspect of this story that makes it so quaint to the modern reader (and a delight as well!) is the positive use of the word "pious" and then referring to food as "victuals." On the day before Thanksgiving the Bassett family receives a delivered letter informing them that Mrs. Bassett's mother is gravely ill. She and Mr. Bassett must fly out of the house to tend to her mother, leaving her six children behind to care for themselves and the house. Tilly, the eldest daughter, decides that on Thanksgiving day she will be in charge of putting together Thanksgiving dinner in the absence of their mother. The whole story revolves primarily around Thanksgiving Day itself and the activities the children involved themselves in and preparation of the meal. Without spoiling anything, the book concludes on a happy note, although perhaps the dinner did not turn out well as Tilly might have hoped. This Holiday House edition of the book is a mere 31 pages, to give you an idea of the length of the story. It is a very manageable holiday read and one that is destined to be read many times over as our family grows up and celebrates the Thanksgiving holiday together. Each holiday should have some traditional books to read. An Old-Fashioned Thanksgiving should be one of them! Vitctals -- ha! Reminds me of the Beverly Hillbillys. I saw that book at the library and considered reading it. With Thanksgiving right around the corner I might just have to bring it home after all. Okay, I STARTED reading this one for the bookclub, but I got sidetracked. I think it would be a good read-aloud, though. It has been a long time since I've read this story . . . you've inspired me to search through my bookshelves for it to read again! oh this looks like a good one! I was just sitting down to write a review of this book for my blog and I really enjoyed your comments (I'll link to your entry). I agree this is a keeper! I just finished reading it to my 2, 4 and 6 year olds.